This state­ment is being issued on the 15th of July 2017 and super­sedes all pre­vi­ous state­ments on the sub­ject. We whole­heart­ed­ly agree with the sen­ti­ments of Shaykh Suli­man Gani! I write to you with great anguish as I bring you the very sad and trag­ic news that Masjid Al-Aqsa has been closed and every­one is being denied access. Not even the Muad­hi­noon (those who call the prayers) let alone the Imams (those lead the prayers) are allowed. There were no Fri­day prayers in the 3rd Holi­est Mosque of Islam, yes­ter­day. Not even the (Mus­lim) secu­ri­ty guards are allowed inside Masjid Al-Aqsa. My beloved Schol­ars, I call upon you to address the mat­ter from the Mosques, the pul­pits, and from your places of teach­ing. The Mus­lims of Britain await you to inform them and to advise them on the actions that must be tak­en. My beloved Schol­ars, if this dis­tress­ing news was about Hara­main (in Hijaaz) how would you react? Would you not be address­ing it most dili­gent­ly in your Fri­day talks, exhort­ing the (Mus­lim) com­mu­ni­ty to engage in prayers, Qunut and advis­ing them to spend their wealth in Sadaqah. Will you not be advis­ing the (Mus­lim) com­mu­ni­ty to turn to Allah Ta’ala and beg for His Mer­cy? I did not hear Ula­ma from the pul­pits in the British Mosques inform­ing their con­gre­ga­tions about Pales­tine and Masjid Al-Aqsa. I did not hear them exhort­ing the (Mus­lim) com­mu­ni­ty to vis­it Pales­tine to show sol­i­dar­i­ty with the oppressed. Above all, I do not hear them con­tin­u­ous­ly and rig­or­ous­ly edu­cate the (Mus­lim) com­mu­ni­ty about the sta­tus and rank of Masjid Al-Aqsa, being the third high­est Mosque in Islam. You are my elders so I turn to you in my dis­tress. I reflect upon myself and admit that I am fail­ing in my duty towards fel­low British Mus­lims. In my lim­it­ed capac­i­ty, I call upon all of you to come togeth­er and pro­vide guid­ance to the British Mus­lims about Pales­tine and Masjid Al-Aqsa. This calami­ty is much big­ger and more impor­tant than dif­fer­ences of opin­ions. I request Wifaqul Ula­ma to make my plea pub­lic, and call an urgent meet­ing on the sub­ject. I implore all my fel­low schol­ars to put aside their dif­fer­ences and come togeth­er on the issue of Masjid Al-Aqsa. I sin­cere­ly hope you all will give me hope and guide me on how to best to edu­cate those who look towards me for guid­ance (as a Schol­ar). To you O Mus­lim! I am human and I for­get. I urge you to remind me that you are keen to know about the plight of the Pales­tini­ans. 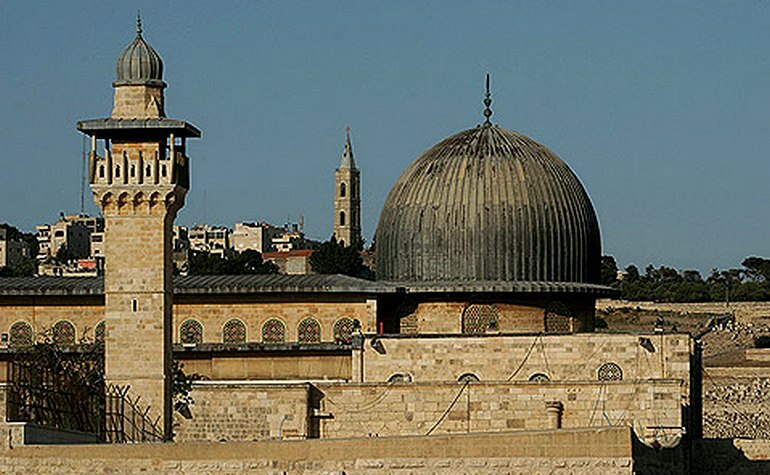 Remind me that you are keen to engage in Qunut for the safe­ty, secu­ri­ty and sanc­ti­ty of Masjid Al-Aqsa. I am your broth­er, I depend upon you. I need your advice on how to best to dis­charge my oblig­a­tions (as a Schol­ar). I need your feed­back, I need you to tell me about my fail­ings and my short­com­ings. I DO NOT want to stand in front of Allah Ta’ala hav­ing failed in my duties. I urge you to help me. P.S: It is 13:30 in Britain and I have just been informed from the locals that Israeli Sol­diers have entered and are now in every part of Masjid Al-Aqsa.